Final Shot - is the hottest FPS of the year! Enjoy Multiplayer battles with tons of weapons and easy-to-use controls! 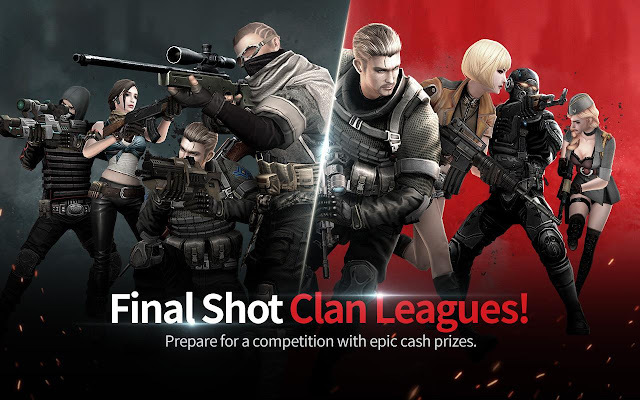 Change the tides of war and make the Final Shot! 1. The best multiplayer FPS for your phone! - Only on mobile! One tap is all it takes to instantly call for backup! - Enter the conflict within seconds of your friends arriving! - Got shot from the back? Use the revolutionary Revenge system! 2. One clan to rule them all! - Get Limited Edition Items from Clan Battle Rewards and Exclusive Shop! - Prepare for epic Cash Prizes in our Massive Clan League! 3. Experience the best shooter modes! - Compete on well-balanced maps designed by FPS experts! - Customize your look and fighting style with unique characters and weapons! - Join Multiplayer battles and Weekly/Season Leagues!" Final Shot: install APK and open and download data via app..